Meta. Meta, meta, meta, meta. There, that's out of the way. "The French Mistake" is Supernatural at its most gloriously self-referential, and that's saying something; this show has gotten a surprising amount of mileage at its willingness to poke fun of itself. On one level, Supernatural is a goofy, angst series about a couple of good-looking brothers who murder demons, a show with a rabid female fan base who are in it as much for the soulful looks and hotness as they are monsters and mythology. (I'm assuming.) On another level, Supernatural is a series that is exactly aware of all that stuff I just mentioned and is more than willing to comment on it. That helps fans who've started to notice that the Winchesters' angst can get a little old sometimes, because it makes us all feel like we're on the same page, somehow. It doesn't suddenly fix any of the show's shortcomings (and you'll notice nobody in any of these fourth-wall-shakers ever talks about the generic hotties who parade through each season, and their unpleasant tendency to die horribly), but it makes everybody in on the joke. Most shows try and create worlds; Supernatural is the rare series that tries to make the show itself part of that world and us along with it. I had some concern going into "Mistake." 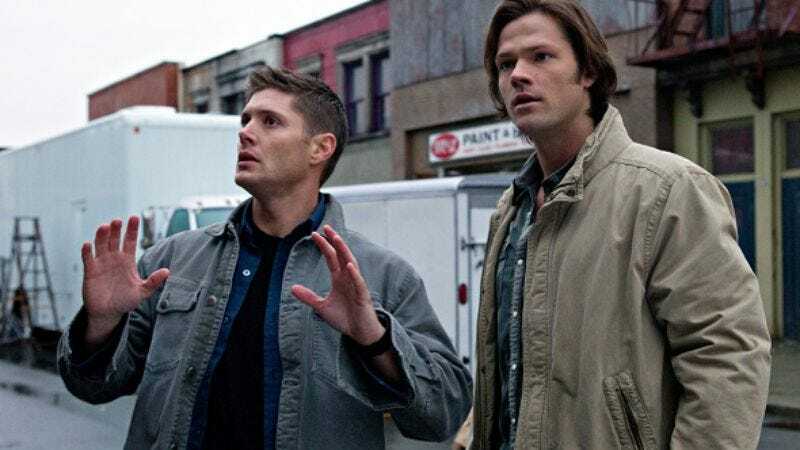 The idea that Sam and Dean would somehow find themselves in our world (sort of, more on that in a sec), where they are actors named Jared Padalecki and Jensen Ackles, is something I've seen done in broad terms on other shows. Others have pointed out the surface resemblance to the Eerie, Indiana episode "Reality Takes a Holiday," and there's a Twilight Zone episode, "A World of Difference," that works roughly the same trick. There are also shows that've presented alternate realities where regular heroes are turned into "normal" people. Buffy The Vampire Slayer did one, as did Deep Space Nine (of all things). Hell, even Hercules: The Legendary Journeys played this game. It's a crowded field, and while I don't expect Supernatural to be the most original show in the world, I was also prepared for a lot of obvious cheap shots and no real depth. Besides, the show has poked so many holes in itself by this point that I worried another jab might be one too many. And really, it was just so perfect sounding, it couldn't possibly be good, right? Well, I wouldn't say "Mistake" is perfect; like nearly every episode this season, it gets a little strange in the last 15 minutes or so, and, sure, some of the jokes are pretty obvious. (Basically, everyone responsible for making the series in this alternate reality is a bit of a tool.) But the episode is so thoroughly entertaining that I don't really want to poke holes in it. There are a lot of fan-friendly references here, a lot of good sports, and a lot of laughs. And it's a generally smart episode, too, in ways I wasn't expecting. There's not a lot of forward motion on this season's main mythology, and I still don't really know what the big confrontation is going to be here. I can come up with thematic connections, but plot-wise, I'm not all that invested in the battle against Raphael in Heaven, and we don't see the Mother of All at, um, all here. Don't care, though. I was too busy laughing and enjoying myself to nitpick. The plot here is basically an excuse, although as excuses go, it's a good one. Balthazar shows up, tells the Winchesters that Raphael is on the war-path, and hands them a key that will open a room where all the weapons Balthazar picked up in his time on Earth are stored. Then Virgil, Weapons Master of Heaven and Raphael booster, shows up, and as he attacks, Balthazar shoves the Winchesters through a window. They land on a set, where Director Bob (Brian Doyle-Murray) is filming the very scene we were just watching, only now, Sam and Dean aren't really Sam and Dean. I mean, that's who they are to themselves, but in this world, they're a couple of spoiled actors, working on the sixth season of a show whose ratings aren't as wonderful as they used to be. Balthazar transported them to an alternate reality to keep them safe from Raphael's stooges. Only now that they're here, how do they get home from a world with no magic? Virgil eventually crosses over to find them (it's very satisfying to see him try and put the mojo on Dean, only to realize too late that he's mojo-less in this new world), but before he does, we get a lot of funny stuff about actors being actors, about a creative team that isn't all that engaged in the work they're doing, and about how Ackles has a really big aquarium in his trailer. Like, crazy big. (Also, he was on Days Of Our Lives!) It's all highly enjoyable to watch, even if it is hitting the exact sort of beats you'd expect them to hit. Which isn't to say the episode is lazy; the way it uses lines from the show-within-a-show to provide explain both to the Winchesters and to us what's going on is very clever, and the running commentary on what it would be like for guys who've grown up saving the day to find a place where the days don't seem to need saving is sharp. "Mistake" isn't exactly deep. It raises some interesting questions, but most of what happens in the finale has Sam and Dean hanging out, observing angels being all catty to each other. But it rewards the fan community with references that never come off as gratuitous or forced, which can be difficult to pull off. I had no idea that Jared Padalecki was married to Genevieve Cortese in real life, but her presence as "Jared's" wife in the episode still worked, because it made for a nice wish-fulfillment moment for Sam. I'm not sure he really loved Ruby back in his world, but he had a strong connection to her before she betrayed him, and wouldn't it be nice to imagine that somewhere, the two of them could actually find happiness? The cleverest trick of all here may be the way "Mistake" initially looks like "our world," with its fanzines and familiar actor names and Vancouver setting, but it really isn't. I'm pretty sure Misha Collins isn't dead in our world, for one, but more importantly, Brian Doyle-Murray isn't actually a series director, and when "Eric Kripke" arrives on set to try and get the crazy Winchesters to calm down, he's played by Micah A. Hauptman. The only people who play themselves here are the actors, and they aren't really playing themselves at all. The "real" world of "Mistake" is a silly, shallow place, full of caricatures and selfish people, and while it's fun to visit, it's a relief when Sam and Dean get back to the real world. At least there, they have a purpose, and if they get a little self-absorbed sometimes, they don't have money to waste on Warhol knock-offs and fancy fish. "So we'd have to blow off the scene where they sit on the Impala and talk about their feelings." "I feel like this whole place is bad touching me." "Dean Cain was like that on 'Lois.' And that man was a real actor." "It appears Jared and Jensen were seen beating an extra to death." "Huh."